It was during the waltz that Lisa returned. The waltz was on a bootleg CD that a friend had sent me that winter. He had sent it because he knew I was recuperating from surgery on my foot and thought that it would help pass the time. Little did he know it, but he had thrown me a lifeline. A lifeline that would save me from myself. I usually enjoy the winter, but that winter was an exception. The chill outside was matched by the chill I felt whenever I tried to enter the world of Funky Winkerbean. I had just wrapped up the very long and difficult story arc about Lisa’s battle with cancer. Following Lisa’s passing, and not wanting to spend a year in comic strip time mourning her loss, I did a time-jump, moving the lives of my characters ahead ten years. I had done this once before in the strip, and it had turned out to be nothing less than wonderful. This time, not so much. The first time I executed the time-jump with my cast of characters it had been meticulously planned out, my readers alerted and stories prepared well in advance. With the first time-jump, I knew what was coming and how it would all culminate with Lisa’s story. This time, I had been way too casual about it and I was paying the price. When I looked beyond Lisa’s story, there was nothing but a void. My current high schoolers were gone, and the new students were strangers to me. Funky had opened a Montoni’s franchise in New York City, and nothing felt comfortable there. Nothing felt all that comfortable about Montoni’s back home either. I had an expat Afghan former insurgent running the place and . . . well, that was pretty much it. What had once been a welcoming stage for my characters now felt cold and empty. Even my third set piece, Les and Lisa’s house, was no longer a familiar setting as single parent Les struggled to raise his now high school–aged daughter. Nothing felt quite right to me, and it wouldn’t be long before nothing felt right to my readers as well. I was not in a happy place. Enter the CD. My friend had sent me a bootleg concert recording of a performer we both admired, but it wasn’t doing much to quell my growing sense of panic [Changes okay? I can put it back if you prefer the original.]. And then I heard the waltz. The singer had transformed one of his older songs into a captivatingly beautiful waltz, which, thanks to modern technology, I was able, at the push of a button, to repeat over and over again. I did this for a really long time. We’re talking an afternoon here. It was during these repeated listenings that it happened. I began to picture Les and Lisa waltzing to the jukebox at Montoni’s. 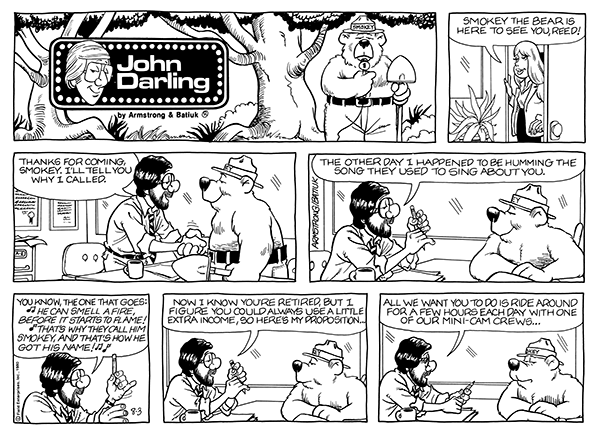 Dancing the full length of the room in one single-panel Sunday strip. Lovely. Which lead to the first question: was Lisa real? Answer: no, of course not; Les was imagining her there. Which lead to the second question: why was Les by himself in Montoni’s late at night? Answer: he has a daughter who would soon be going to college and, even with her sports scholarship, needs to augment his teacher’s salary by helping out Funky while he was at the New York Montoni’s, so he agrees to be the night manager. Question: sports scholarship? Answer: yes, Les, the nonathletic leader of the out crowd in his high school days, has a daughter athlete who’s the star of the girl’s basketball team, and it’s at the practices that he’ll eventually meet the mother of one of her teammates, annnnnd we were off and running. I realized that Lisa’s story wasn’t over and that there was a final chapter yet to be told. That Lisa’s pervasive influence in the strip was still ongoing and that I had also left myself a number of Easter eggs to be rediscovered that would link back to and tie a bow on some of the story arcs from the previous two volumes in this trilogy. Happily, there was still more work to be done as I continued to explored the innumerable gifts of Lisa’s legacy. 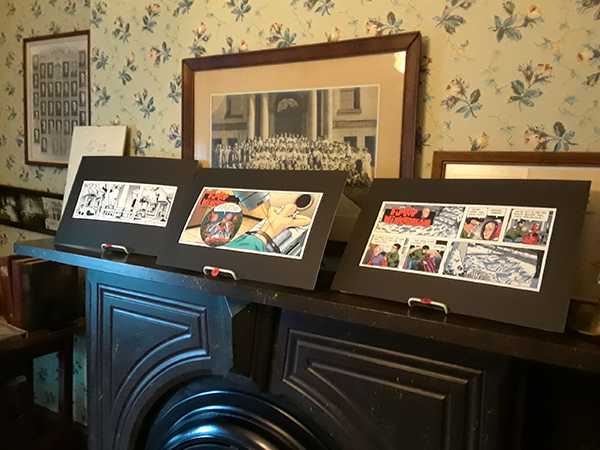 Here’s another pic of some of the prints from Lisa’s Story now on display at Thurber House. 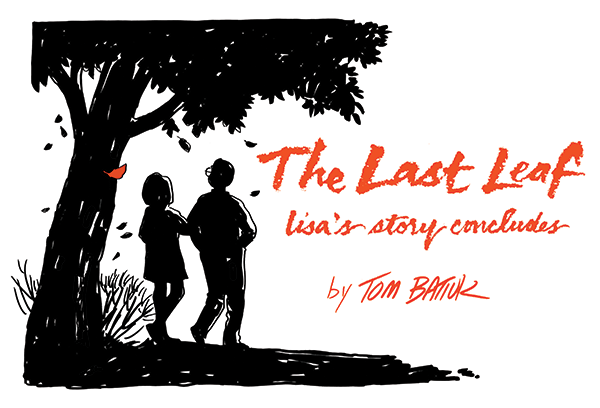 Thurber House is presenting the launch of the Lisa’s Legacy Trilogy at the Columbus Museum of Art on Sept 27 at 7:00PM. To learn more about that and other signing events coming up this Fall, just visit the Events page on this site.